God crowned all that he had made by the creation of human beings in his image and likeness. God gave human beings dominion over all the earth, that is, he gave them responsibility for cultivating and caring for all of his good creation. This sacred trust must not be abused. Human beings are not to be tyrannical rulers of the natural world. Rather, God calls us to be benevolent stewards of the earth. The Benedictine charism, notable for simplicity, humility, stability, and hospitality, is especially well suited to sustainable stewardship of the natural environment. The simplicity of the monks’ lifestyle avoids many of the excesses that damage the natural environment. Humility keeps the monks close to the earth. The vow of stability commits each monk to the particular place for which they are called to care. Hospitality demands that the place remain welcoming for future generations. At the Monastery of Christ in the Desert, sustainable stewardship is one way in which the monks participate in God’s good intentions and active care for our world. 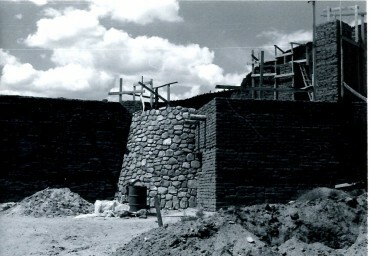 To this end, the monastery has consistently employed natural building techniques for construction projects and adopted sustainable and energy efficient technologies for utilities. From the moment the first monks arrived in 1964, the beauty of the Chama River Canyon has continually inspired prayer and praise. It seemed desirable for the monks to learn to simply fit into a natural environment that was itself already praising God for such glory. Sustainable stewardship has been an integral part of the monastery’s character ever since then. In the early years the primitive conditions of the monastery were part of its appeal, particularly for guests. Something touches the soul when life is kept simple and primitive. The monks were young and happy to rough it in the wilderness. The church was originally heated by propane stoves, a cheap and relatively non-polluting option. On Christmas Eve, 1974 it was -7°F in the canyon. Even though the propane stoves had been running full blast for three days, they were unable to raise the interior temperature above 0°F. Blankets were needed in the church to survive the cold. Until 1996, woodburning stoves were the norm for heating in winters (as cold as -35°F), and kerosene lamps were the standard for light. Over time the monks began to realize that their life of prayer was itself tough and a rare kind of life, and changes could be slowly introduced to better accommodate guests and older monks on the physical plane. The more advanced sustainable systems that the monastery now uses are the current expression of the monastery’s early commitment to sustainable stewardship. In 1988 the monks decided that it would be important for the future of the monastery to build an adequate facility in which both young and old monks could live and which would be set up in a traditional monastic fashion. construction costs must be minimized. This vision has helped create one of the most beautiful monasteries in the world. Today the monastic community continues to think about the future and about ways of living in this beautiful canyon that will preserve nature and allow humans to live here in peace. The rest of the complex has developed in phases. South of the church are the current guest center, refectory, kitchen, and laundry room. North of the church are the offices, library, chapter room, recreation room, cloister, old cells, and novitiate. Building in phases gave the monks the opportunity to continually improve their use of sustainable design and natural building methods. Since adobe can be found in the canyon, it has consistently been used in the building projects at the monastery. Also, straw bales form the interior of many of the walls here. Straw is sustainable, cheap, and a great insulator. 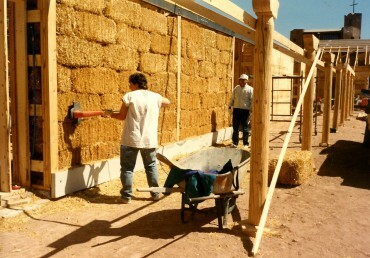 After the bales are set in place, they are protected on the exterior with an adobe finish. The natural beauty of adobe has allowed the monastery buildings to fit pleasantly into their natural surroundings. Much of the timber used in the building projects was harvested from the canyon. Timber that was not harvested from the canyon was obtained through a local non-profit NGO that facilitates sustainable standards for the Southwest wood industry. Wood is one of the few natural resources that is not limited, but it is important to harvest it responsibly. The monks know quite well that wise harvesting and good forest management provides wood for future generations, preserves watersheds, provides wildlife habitats, stabilizes community economics, and helps ensure the biodiversity necessary for healthy human life. 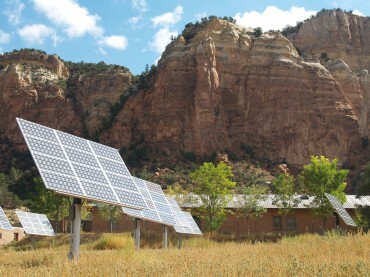 The Monastery of Christ in the Desert operates primarily on solar-generated power. Solar arrays gather energy throughout the day and store it in batteries, which then provide the monastery uninterrupted power 24 hours a day. When battery storage is insufficient from time to time, a propane generator supplements the supply of electricity. Still, conservation of electricity is a high priority. One way to reduce the use of electricity is to utilize natural light as much as possible. Most of the interior of the monastery buildings are lit by strategically placed windows, skylights, and parabolic reflectors. Passive solar heating and cooling systems are used wherever possible throughout the monastery. These systems are simple in design and use, as long as buildings are oriented correctly (with access to the solar south) and the spaces are able to collect the solar energy. Many of the southern walls of the monastery are designed to trap heat when the sun is out and release it in the evening when the sun goes down. Overhangs shade the walls in the summer to protect from overheating. In the cloister, which is located in an area not conducive to passive solar design, an active hot water system heats the cells. Water is pumped through collectors exposed to the solar south, and then it is circulated through storage tanks where heat is transferred by conduction to water that runs through tubes in the floor of the cells. Heat from the water is transferred by conduction to the floor material, which stores the heat and releases it throughout the day. This collector system also heats the domestic water used in the sinks and showers in the cloister. Like all the utilities at the Monastery of Christ in the Desert, our water system is entirely self-sufficient. Our water source is an infiltration gallery about 50 feet from the Chama River. From there, the water is disinfected and pumped uphill into three storage tanks that supply the monastery with all its water. Drinking water is further purified by reverse osmosis. The monastery uses a constructed subsurface flow wetlands to treat wastewater. Constructed wetlands apply the concepts of natural wetlands to treat pollutants. This consists of a man-made marsh of bulrushes, cattails, reeds and other plants and flowers to breakdown solid waste and chemicals by the use of bacteria and other microorganisms,. This enhances the beauty and fragrance of the environment as well as increasing its biodiversity. Having a self-sufficient water system has taught the monks the vital importance of protecting natural watersheds. They carefully protect their surrounding land from excessive erosion and removal of local vegetation so that the biodiversity of the area is not adversely affected.